While alive and aware of baseball when this set came out, my post-hippie parents never bought me Hostess snacks in those salad days. Naturally, they claimed the high sugar content would rot my teeth and head. Hostess panels still could've ended up in my hands, as we shopped at plenty of bargain bakeries with leftover products, but it never quite happened. 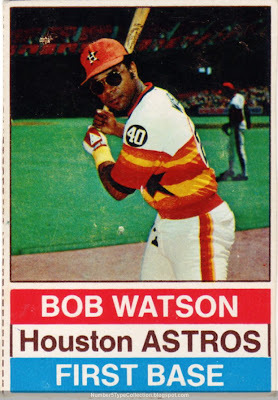 If I'd seen this awesome shot of Bob, though, my card collection might've started a little earlier. Yellow sweatbands and rainbow stripes are just the start on this standout card. Uniform of many colors: They’re not quite Tucson's Toros, but this Astro look was the brightest MLB had to offer in 1976. Astroturf: The eponymous artificial surface dominates our background, evergreen and triple-seamed. Red, white, and blue banner: USA’s bicentennial loomed over everything that year. Aviator sunglasses: Playing on Astroturf doesn't mean a man can't look cool. Questionable border trimming: Each Hostess box included a panel of three cards for kids to cut out. This one sorta followed the dotted line, a bit of which is still visible at left. This card's essential to my collection in an Abba's Greatest Hits kind of way. Naturally, I also voted for this #5 in Dinged Corners's "guy wearing glasses" survey. Hostess printed most of their baseball set as 3-card strips on snack cake boxes. 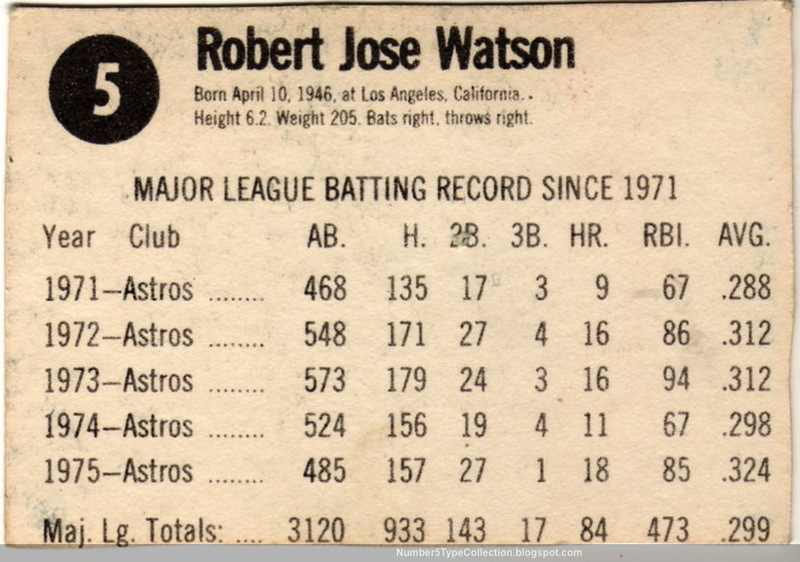 Watson shares the #4-5-6 panel with Gaylord Perry and Bill Freehan. Hostess also printed this gatefold All-Star Team "album" for kids to display their favorite Hostess players as 9-position lineups. Being disposable paper giveaways from the 1970s, they're hard to find in good shape today. Click through the image for more detail, including a bunch of trivia questions on this back page. I've seen a lot of esoteric trivia, but didn't understand this one at first. "Q: Who is the all-time strike out per at bat leader? A: Woody [sic] Held with an average of .235." 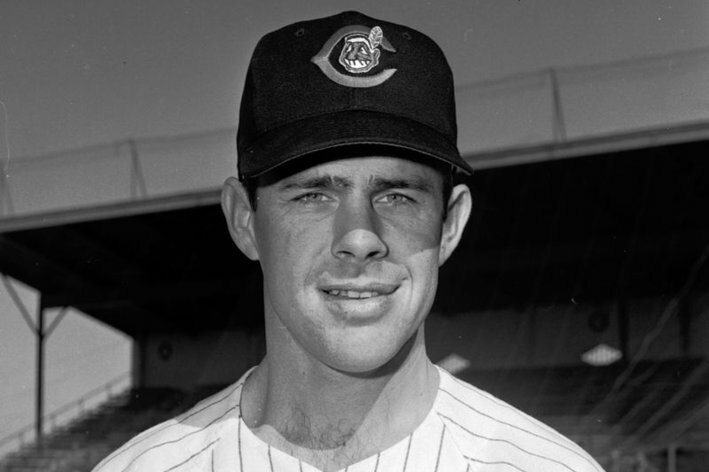 Woodie Held slugged well for a 1960s shortstop, but he struck out like a 21st century first baseman. The trivia question reads oddly because its 3-digit "rate" resembles a batting average. 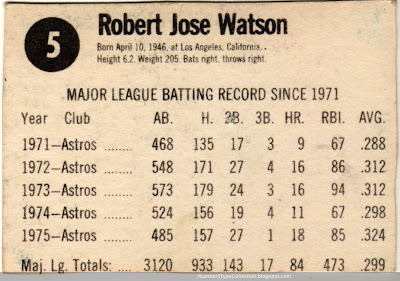 Stat trackers today would say that his AB/SO ratio was 4.2574 (career stats). So is the answer correct? Not quite. At the end of 1975, when Hostess prepped their set, Woodie almost "held" this record. Tommie Agee had retired in 1973 with 4.2614 AB/SO (career stats), just a notch better in context. The most recent Hostess album question is dated 1966, so I assume card editors copied its trivia from a 1960s source, before Agee was in the picture. Value: Hostess type cards are plentiful and cost a dollar or two in low grade. Fakes / reprints: It'd be hard to make money faking cards this cheap and I haven't heard of any in the market. Likewise, I'd never seen one until this year!